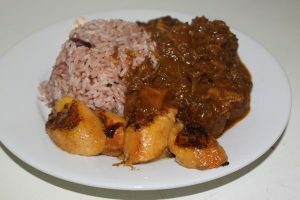 Curry Goat rich and full of taste, great comfort food and fairly easy to make. The hardest part is finding the Goat Meat, it seems easier now to get Goat meat but you have to be careful you are not palmed of with mutton. So here we go I suggest you buy Goat with bone in which does add much more flavour to the dish. Dice the goat and mix in curry powder leave overnight in fridge to flavour up. In a large Saucepan I use a Dutch Pot, Brown onions and meat, stir in tomato and coconut milk plus salt pepper and Soy sauce. add stock and bring to boil, once boiling turn down low to simmer for 4 hours or until meat is tender. Keep checking to make sure it doesnt boil dry top up with water to keep moist, when meat is nice and tender season to taste then stir in the seeds, broad beans and Potatoes simmer for another 30 mins. Serve up with a cup of rice and beans, fried Plantain and coleslaw.